Then a man came and wrestled with him (Jacob) until just before daybreak. When the man saw that he was not winning the struggle, he hit Jacob on the hip, and it was thrown out of joint. "What is your name?" the man asked. "Jacob," he answered. Jacob said, "I have seen God face-to-face, and I am still alive"; so he named the place Peniel. The sun rose as Jacob was leaving Peniel, and he was limping because of his hip. If he were alive today, Jacob, son of Isaac was the sort of character that lots of companies would love to have as one of their top executives. Energetic. Lots of initiative, to the point of being aggressive. Few scruples when it came to getting what he wanted. He was not one to take "No" for an answer. If he had something in mind, he would go for broke to get it. Even when the chips were down as in today’s reading about his difficulties at the River Jabbok, he was determined to turn it into profit. He was not one to give up easy in the face of trouble. As I said, the business world would clamour to have such a person on their pay roll. I reckon Jacob would have made a great car salesman. I can just hear him say, "Hi! My name is Jake from Rusty Car Sales. We have beautiful previously owned, low mileage automobiles with no deposit and payments that anyone can afford. No reasonable offer for one of these beauties will be turned down". Jacob, the son of Isaac, never gave up until he got what he wanted. The story of the wrestling match on the banks of the Jabbok is not an easy one and I’ve got more questions about this event in Jacob’s life than I have answers. But let’s try by looking at the background of everything that has happened so far in Jacob’s life. Jacob was the second born of twins. He came into this world with his hand grasping his brother's heel, almost it seemed, trying to pull Esau back so that he could get out ahead. His parents named him Jacob, which means "grabber". This was sort of a prophetic foretaste of what kind of person Jacob would turn out to be. By hook or by crook Jacob wanted desperately to always be the winner by trickery, scheming and grabbing what he could get. He spent his life getting out of one tight spot and quickly ending up in another. He had become his mum’s favourite at home, swindled his brother Esau out of his birthright, and tricked his dying father into giving him, not Esau, the family inheritance. He becomes a fugitive when his brother puts his name at the top of a hit list. Then after 20 years Jacob wants to go back home. Back to the brother who had threatened to kill him. Back to the father he had cheated and lied to. (Isaac lived until he was 180 years old and both sons buried him). Tomorrow he will stand face-to-face with the brother whom he has so grievously wronged. Will Esau receive him or kill him? Jacob is worried. Really worried. He’s worried because his brother has come with a force of 400 men. In order to soothe the anger of his brother, Jacob organises presents from amongst his livestock to go ahead. Then he wakes up the whole camp and sends his wives and children across the river. If Esau had any thoughts of attacking as they crossed the river then Jacob would be one step ahead. Yes, a river crossing is dangerous in the dark, especially for the children and smaller animals. But it is not as dangerous as being ambushed there in the morning. So Jacob, one again the schemer plans to outsmart his brother. Jacob is the only one left behind. It’s night. And Jacob is assaulted by a stranger. Who is this stranger who jumps Jacob in the night? The story only says "a man came and wrestled with him until just before daybreak". It's dark. Jacob may have thought the attacker was a robber or even his brother who had sworn to kill him. However, by morning, Jacob will say that he has fought with God. This must have been quite some wrestling match. Bloody nose for bloody nose. Blow for blow. Head-lock for head-lock. Then the man touches Jacob’s hip and dislocates it. Jacob realises that this man is not a robber; he is looking at the face of God. Near dawn, gasping for breath, exhausted, they speak. "Let me go, day is breaking," says the man. "Well, what's your name?" asks the stranger. "You are no longer called Jacob. You are Israel. You have struggled with God and people and have prevailed." Jacob didn’t get an answer to his question. What he got was a new name, a new identity through the assault of God. We have known this rascal Jacob by the names "Trickster," "Grabber," and worst of all "Heel". Now he is called "Israel" which means "God preserves" or "God protects". With the new name, there comes a new person, a new man, a new people has been formed, called forth. Jacob, now known as Israel is the one who has faced God, struggled with God, been gripped by God, given a blessing, and renamed. Jacob is forever changed. When daylight comes, God is gone. So is Jacob. Now, only Israel remains, walking with a permanent limp. That night, Jacob the man who was always so sure of himself, ready to cheat his own brother and father, the schemer, the liar, the deceiver became a changed man and his new name "Israel" is proof. With great relief and gratitude Jacob acknowledges that he had been spared through God's gracious goodness, when all he deserved was to have been crushed thoroughly and completely. He had always thought of himself as a self-made man, a person who was in control of his life, but now he realises that in God’s eyes he wasn’t some great hero of earth-shaking significance after all. Rather, he was a pesky bug, a little buzzing nuisance, an arrogant sinner. And yet, wonder of wonders, God came down in human form, came down to Jacob’s level and engaged in this wrestling contest. He did this because he loved that pesky, buzzing, wiggling little arrogant speck of a person. He loved him! He blessed him! No one gets to see the face of God, least of all a man like Jacob. It’s no wonder he says in amazement, "I saw God face to face, and I am still alive." 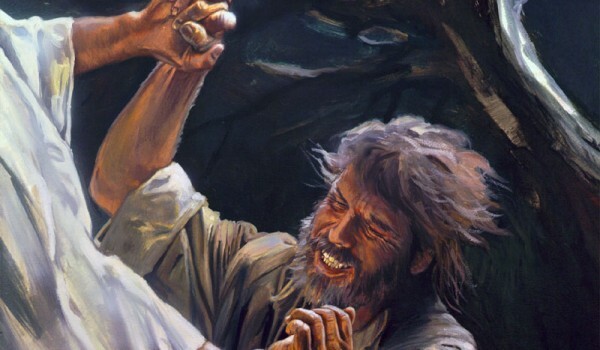 Jacob is weakened by his encounter with God's power. But strangely, he is also now much stronger - stronger because he leans on God's power. God has come down to interact with and for us, too. This time it is Jesus, God the Son who comes down. He became human. He wrestled with those who would not heed his call to "repent", turn away from their sin. He wrestled with Satan, with sin and with death. And he won! He won, and so as the victor, gives a blessing for each and every person. He declares that we are his children, that he loves us, forgives us and will always walk with us. He came down and wrestled us away from Satan and brought us into his kingdom. The amazing thing that Jacob's story illustrates is that, whatever our past, whatever our previous priorities, Jesus never gives up on us. It is his strength that comes to us and makes us strong for the struggles we will face yet in this life. and that he will be there when we have to wrestle with some of life’s disappointments, doubts, and confusion. Yes, that’s right. There are times when we have to wrestle with our own failings – the times we are disappointed in the way we have responded and acted. "Where is God when I need him?" "Why is God allowing this to happen to me?" We wrestle looking for answers, for help, for strength and in his grace God allows us to wrestle with him as we try to come to terms with what has happened or is happening in our lives. Sometimes God uses calamity, tragedy, or danger in our life so that we are led to the obvious answer – that is, trust him that everything is in his loving hands and nothing can cause him to love us any less. Sometimes God uses unemployment, or poverty, problems with our children, health issues and the struggles in our life so that we will look only to him and depend on him when life’s problems get us down. Suffering is not part of God's plan for us and he is saddened when he sees the pain we cause others and ourselves. But at the same time, he will use all this to guide us and lead us closer to him if he has to. And, perhaps he already has for some of us here. and like Jacob, we are made new with trust in God, and refreshed in our relationship with God, assured of the blessing of God. May God’s Spirit use the struggles that we have in this life to draw us closer to our Lord. May God’s Spirit use the problems we wrestle with to once again reassure of the love and grace of our God.